1 How Does a Leaf Vacuum Mulcher Work? 3 How Much Does a Leaf Vacuum Mulcher Cost? 4 Should I Get a Leaf Vacuum Mulcher? 5 What is the Best Gas Leaf Mulcher? 6 What is the Best Electrical Leaf Mulcher? 7 What is a Leaf Shredder? It’s fall season again, and we all know what that means! The mention of autumn likely conjures up a lot of thoughts. This joyful time of year claims the festivities of Thanksgiving, the horrors of Halloween, the excitement of football, the rigors of a new semester, and, of course, the beauty of leaves. Everywhere you turn, leaves change color, creating vibrant and beautiful landscapes nearly everywhere you go. But, while they may be beautiful to look at, there’s just one problem. They’re going to fall. All over your yard, all over your roof. Not only does this create aesthetic problems in your yard, but it poses a safety problem with your roof. However, continually raking leaves is time-consuming and can be painful, and leaf blowers have their own problem. Neither of these two options provide a means of effectively dealing with your leaf problem. Instead of getting RID OF LEAVES, they MOVE THEM somewhere else. And, while you can always bag leaves for disposal, this can be time consuming and efficient. So, what’s the solution? If you’re tired of manually disposing of leaves and raking them up, there’s only one thing you can do: invest in a leaf vacuum mulcher! This powerful tool will give you the ability to instantly remove and mulch any and all leaves that have fallen, saving you time and energy! Keep reading below to find out how a leaf mulcher can best benefit you! How Does a Leaf Vacuum Mulcher Work? So, you know WHAT leaf vacuum mulchers do. Now, it’s time to learn HOW they do it! Think of it this way: if a vacuum cleaner and a leaf blower could have a kid, it would be a leaf vacuum mulcher. As the name implies, this great tool vacuums up leaves from your yard, roof, deck, or patio! But, it doesn’t stop there! After picking up your leaves, this powerful device will then mulch the leaves so that you don’t have to worry about them ever again! Sound too good to be true? Well, it’s not! The leaf vacuum mulcher comes with a nozzle end that attaches to a tube protruding from the body of the device. This allows for you to vacuum leaves from just about any spot! Even hard-to-reach areas can be reached with a great leaf vacuum mulcher, giving you greater control over your yard! Better yet, it’s one-of-a-kind abilities help save you time and energy every step of the way! You’ll never want to go back to a rake or a leaf blower again! It’s important to note, however, that not all leaf vacuum mulchers are equal. There are various factors that determine the quality of your leaf vacuum mulcher, and you should make sure that you pay attention to them so that you can really get your money’s worth. This is true no matter if you’re buying a gas or electric leaf vacuum mulcher. Let’s take a moment to think of some of the considerations you should make. First, what would you expect from your vacuum cleaner? Surely, you wouldn’t buy one that had low suction power. The same is true for a leaf vacuum mulcher. Because it works in a way very similar to a vacuum cleaner, many of the same considerations you make when choosing a vacuum apply here. The most obvious and important thing is to make sure that you have a vacuum that can actually clear up the leaves in your yard. If your leaf vacuum mulcher has low power, it cannot efficiently clear your yard or roof of leaves, and it reduces the effective range of your device. Finding a leaf vacuum mulcher with great suction abilities gives you greater flexibility in how you clean your yard. You should also check the weight of the device. Because you may be using the machine for long periods of time, you need to make sure you can hold it for extended periods. This ensures that you can get the maximum amount of work done. You should also make sure that other members of your household can handle it easily so that you can help share the burden of work. How Much Does a Leaf Vacuum Mulcher Cost? The short answer is: it depends. Just like other devices, the cost of a leaf vacuum mulcher depends on the quality, type, and brand that you buy. If you’re going for a higher-quality and more productive machine, then the price will, of course, be higher. However, you may not need such an expensive device, especially if you have a small yard or do not plan on using it often. It’s important to find a machine that fits your budget but that can also provide you with quality results. Ultimately, the decision is up to you and your financial circumstances, but you should always make sure that whatever device you are getting is worth the money. If you are not someone who rakes and disposes of leaves regularly, you may not want to invest much money in a leaf vacuum mulcher. The good news is that even quality leaf vacuum mulchers are relatively cheap! This means that you don’t have to break your bank in order to buy one and that you can get started leaf vacuuming and mulching right away! Even great brands such as Toro and Black and Decker can be found for less than $150, making this product too tempting to pass up. 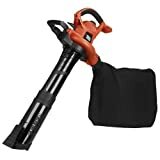 Should I Get a Leaf Vacuum Mulcher? It depends. There are certain situations where a leaf vacuum mulcher can greatly improve the quality of your life. This includes if you live in a place with a lot of leaves. As leaves can fall on your roof or on your pathways, making them both slick and dangerous, having a leaf vacuum mulcher can be a great way to maximize your safety while making sure that your yard is both neat and beautiful. Furthermore, if you’re in the leaf-raking business, you may want to invest in a leaf mulcher, as it will save you time, effort, and money in the long run. You won’t have to waste time raking manually, and you can have leaves instantly disposed of. Furthermore, there are some health conditions that might make a leaf vacuum mulcher better for you. If you are someone with low back or other back and neck problems, hard manual work with a rake can leave you feeling worse or lead to serious injury. In such cases, having a leaf vacuum mulcher can help protect your health! However, if you aren’t one who regularly rakes leaves, and you have no physical benefit to getting a leaf mulcher, the ultimate decision is yours. While a leaf mulcher can make life more convenient for you, if you are someone who prefers the toil and labor required in order to rake leaves into a pile, bag them, and then throw them away, a leaf vacuum mulcher is not right for you! This product saves time and energy, so if you enjoy the process of cleaning your yard, you may be let down. What is the Best Gas Leaf Mulcher? If you’re looking to grab a great leaf mulcher, you have one of two options – you can either choose a gas or an electric device. And, because this can be confusing at first, we’ll give you our opinion on the best two gas leaf mulchers below! Hitachi RB24EAP 23.9cc 2 Stroke 170 MPH Gas Powered Handheld Blower: This incredible device combines the power of a gas leaf mulcher with all the speed and convenience of an electric device. It’s great power and top-quality speed make vacuuming even large areas a quick and painless task! With an auto-reset button, this Hitachi device improves stands out among gas-powered options! Husqvarna 125BVx 28cc: This is another great gas option that improves over some of the regularly-seen drawbacks with gas-powered leaf mulchers. While retaining the power you’d expect from a gas leaf mulcher, this device offers a unique lightweight design that allows for easier and more comfortable handling. This gives you the chance to use it for longer periods of time without tiring, giving you the chance to get much more of your yard cleared! A great choice for gas-powered devices! What is the Best Electrical Leaf Mulcher? As noted, there are also electrically-powered leaf mulching options. Getting an electrically-powered device has its own set of perks and drawbacks, so we’re providing you with two of the best options below! Toro 51609 Ultra 12-amp Variable: This powerful leaf mulcher is one of the industry’s standards. Because of its magnesium blades and high-speed, this device is great for vacuuming and mulching large numbers of leaves at a time! The high speed of the device combines with its power, allowing you to vacuum even wet and other hard-to-vacuum leaves. And, because of its one-of-a-kind blade design, you can be sure that you can mulch away without clogging! This improves the device’s efficiency and gives you the tool you need to vacuum and mulch even the most difficult of areas! Black and Decker LSWV36: This device comes from another top brand in the leaf-mulching industry. It lives up to all the hype that you would expect from a Black and Decker device. With its inclusion of a lithium-ion battery, this product increases convenience and usability, as you do not have to have it connected to an electrical supply to use it. This means that you can use it to cover large yards and other areas with ease! Furthermore, it boasts all the power needed in order to get the job done while keeping a low volume! This makes it a perfect choice for nearly every home and garden! What is a Leaf Shredder? A leaf shredder is a unique device that uses cutting-edge technology to dispose of leaves in your yard in the most efficient way possible. Much like a lawn mower, this device can be taken across your yard. However, instead of pushing leaves and other debris into the soil, they mulch, shred, and dispose of leaves in a way that is healthy for your yard! By not pushing unnecessary items into the soil, a leaf shredder makes your yard healthier by allowing for the growth of grass and other plants. Furthermore, you can use the mulch that your shredder produces in order to fertilize your soil and stimulate further growth. This makes a leaf mulcher an extremely eco-friendly option in treating your yard for leaves! If you’re one who prides himself on being good for the Earth – or one who simply wants to have a good-looking yard – a leaf shredder is the right choice for you. Only a leaf shredder can give you the ability to fertilize your yard with its own debris! This type of ecofriendly recycling improves the environment and gives your yard the look you’ve always wanted! For those who are tired of raking leaves manually or using loud leaf blowers that do nothing more than push leaves around instead of disposing of them, the next big thing is here! Leaf vacuum mulchers and leaf shredders do the hard work for you by vacuuming up leaves and mulching them into fertilizer that you can use later. With varying grades of quality among these devices, it’s important that you make sure a device meets all of your standards and needs before you purchase it. You should consider how heavy a device is, its ease of use, power, and range. You should also take into account the differing types of leaf mulchers, from gas to electric, so that you can determine which type is best for you. Only after assessing your own unique situation can you decide which device is best for your budget and your yard. However, with the helpful tips above, we’re sure that you can make the most-informed decision possible! Save time and start to enjoy the fall season with a leaf mulcher today!